Haiti's Prime Minister Resigns After Riots Over Fuel Price Hike Haiti's prime minister resigned before he could be removed from office by the country's parliament. The government announced a double-digit price increase in fuel, sparking riots this month. 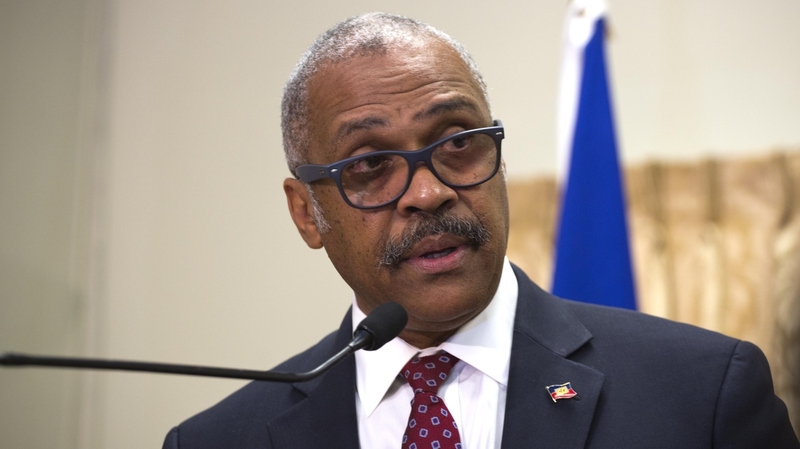 Prime Minister Dr. Jack Guy Lafontant speaks at the national palace in Port-au-Prince, Haiti, in 2017. He resigned following riots over fuel prices. Lafontant, a doctor who only took up the job of prime minister in early 2017, resigned shortly before a no-confidence vote was to be called in Haiti's parliament, which could have led to his removal from office. By the following day, Lafontant said the price rises would be suspended, and said the government "strongly condemns the acts of violence and vandalism" that happened after the initial announcement was made. The Herald reports that for the past week, Lafontant "had refused calls to step down from business and opposition groups, which accused the government of mishandling the double-digit fuel increase that its ministers announced with little notice." Haiti's government subsidizes the cost of fuel in the country. The World Bank said in a report last year that the richest 20 percent of Haitians were receiving 93 percent of the subsidies and that the country was spending 2.2 percent of its GDP on subsidies in 2014. But the price hikes were too much to bear for many in one of the world's poorest countries. The World Bank says the majority of Haitians, about 59 percent, make less than the equivalent of $2.41 per day. The U.S. State Department issued a "do not travel" warning for U.S. citizens on July 9 over what it called "widespread civil unrest and violent demonstrations in Haiti. Protests, tire burning, and road blockages are frequent and unpredictable."